January 12, 2018 - Start of phase II of "HOME RESIDENCE SOFIA"
In an old Bulgarian tradition the ceremony took place under the sounds of bagpipes, drums and folk dances. The event brought together IDEA HOME's longtime partners, clients and friends. The exterior of the building is modern with large, clean shapes, characterized by a clear composition of volumes lined with HPL lamellas protruding from the plane of the façade. "Just a year ago, we made the first sod at entrance A of HOME RESIDENCE SOFIA and we can already boast that this part of the building is built on a rough construction. Today we go on and start the entrance B promising the same quality of materials and performance to turn this building into the most beautiful and functional one in the area. " The object is a multifamily residential building situated on a communicative and visible place in a property located between a boulevard and an inner neighborhood-street. The sought-after style of the building is modern, with large, clean shapes highlighting a clear composition of volumes lined with HPL lamellas protruding from the plane of the façade, which is resolved in a dark gray silicate plaster. Here you can see the projects of "HOME RESIDENCE SOFIA"
The first and second buildings of HOME RESIDENCE SOFIA are thought carefully so that their exterior solution is in unison and create a common and complete appearance. Despite their likeness, the buildings have different distributions, with the greatest variety of apartments being sought for to meet the needs of the occupants. 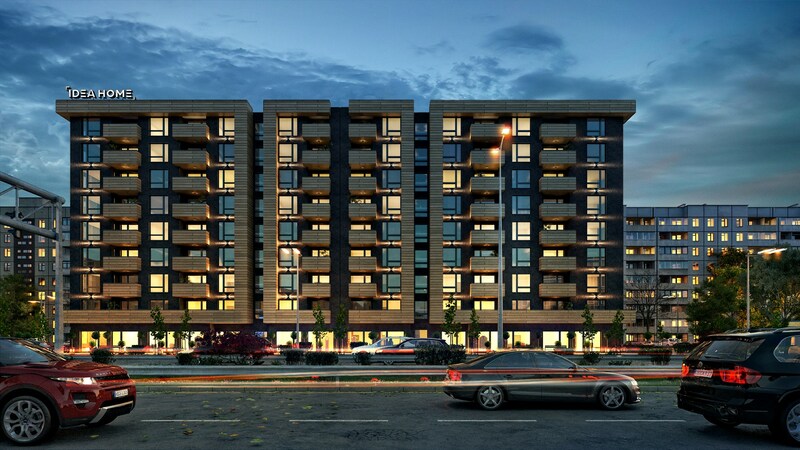 Functionally the building is designed on nine above-ground floors and one underground and is intended for homes, shops, garages and underground garages and the levels are utilized as follows: On the underground floor are located 24 parking spaces evacuation and vertical communications. On the ground floor or elevation ± 0.00 there are eight shops and six double garages and an entrance to the residential part. From the first to the eighth floor there are three three-room apartments, three one-bedroom apartments, one studio and a staircase with a lift. Location: Bulgaria, Sofia, district Vrabnica, Lomsko Shose Blvd.